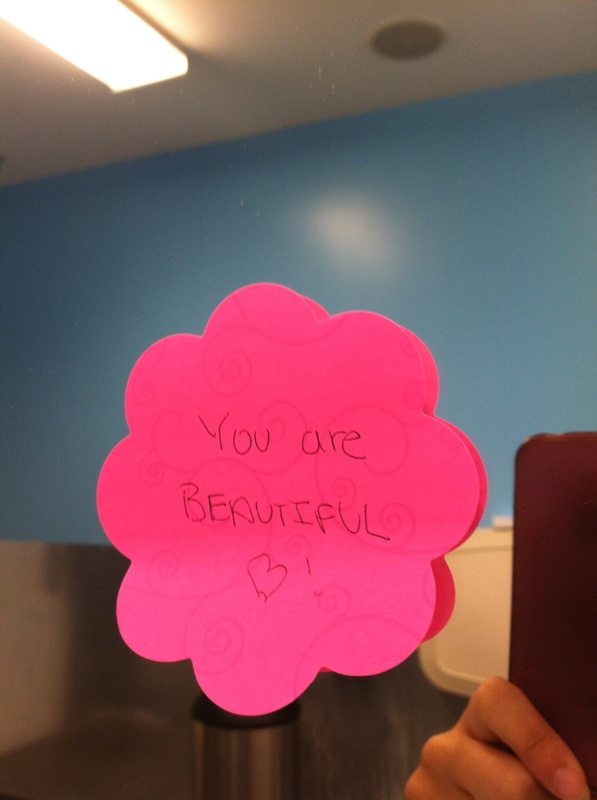 The lucky (or maybe unlucky, depending if they like random notes in their public bathrooms) stores I went to included Barnes & Noble, Old Navy, Model’s, Best Buy, and a general public bathroom at the mall. 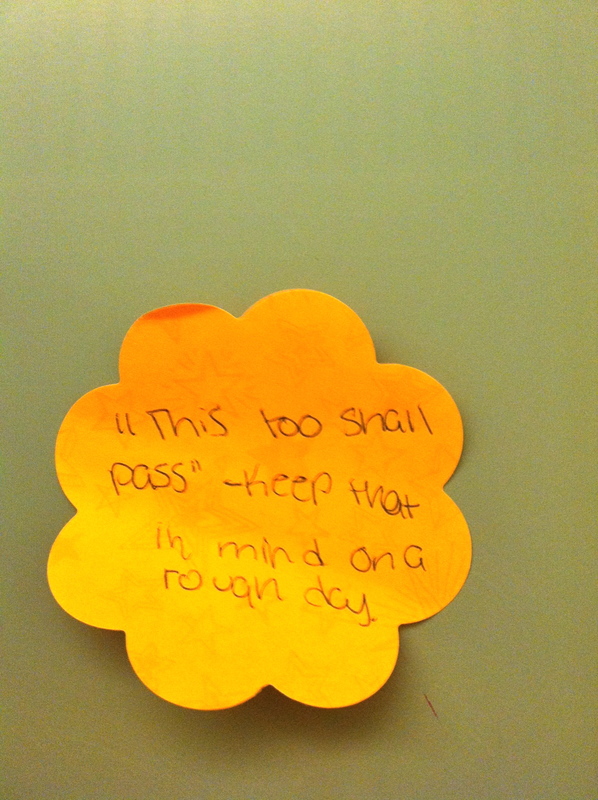 I placed about 20 sticky notes in total in either the stalls or on bathroom mirrors, with both messages and quotes. In the gallery, you guys can take a look at some of the stuff I wrote. So has anyone done something similar or plan on adding this one to his or her bucket list? I’d love to hear about your experiences! 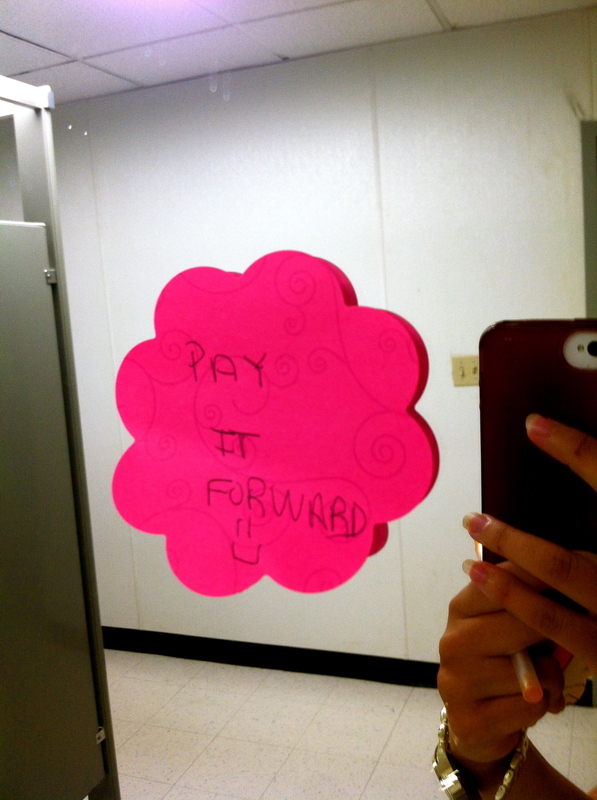 Gallery | This entry was posted in Kind Acts & Volunteering. Bookmark the permalink. Neat idea. I’ll have to try this. Thank you 🙂 Definitely let me know if you do! 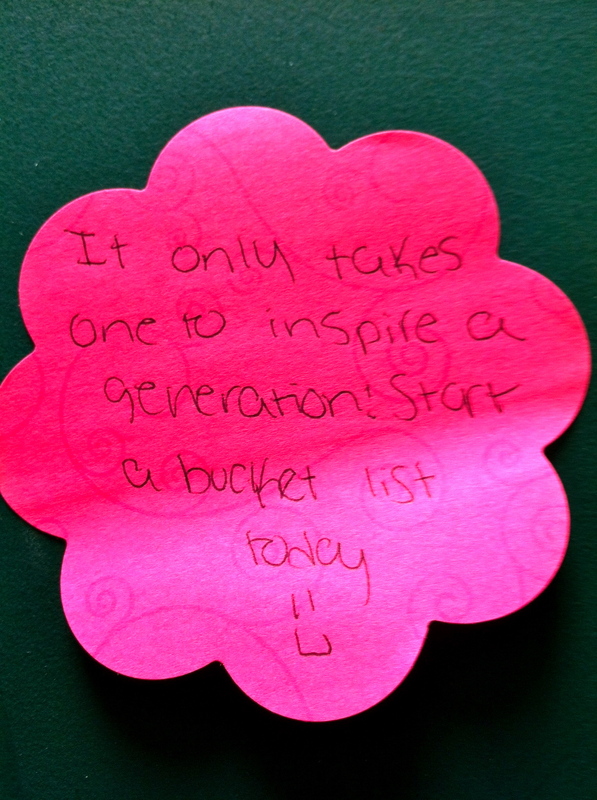 Love the idea! Will try it out tomorrow! 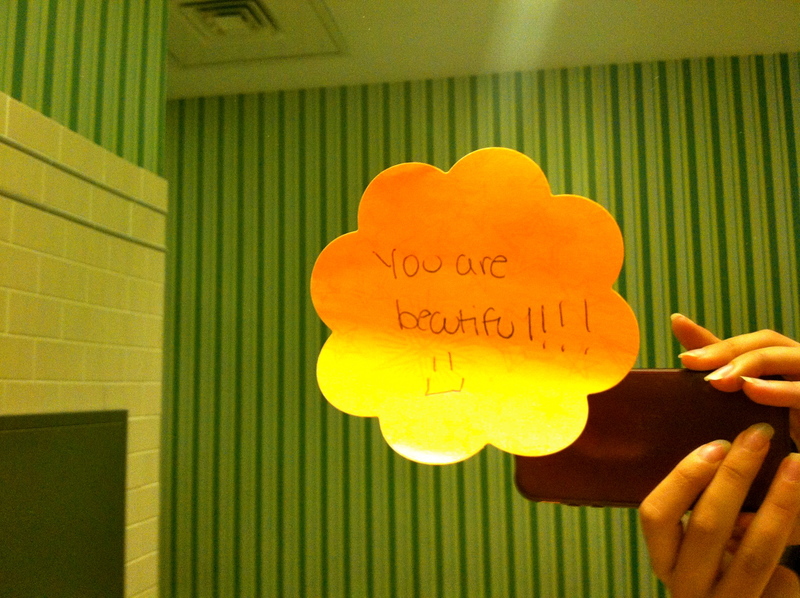 Aw, I found this to be a very sweet way to brighten other people’s day! I like it and think I’ll try it too! Thanks for sharing! 🙂 Nice idea to try making a small difference in whatever way one can! Love, love, love the idea. And thanks for the follow. I love this idea. And thank you for discovering my blog and deciding to follow it. I like to write about inspiration, creativity, writing, the arts. I look forward to more of your posts! Thanks so much 🙂 And you’re very welcome! Glad I found it! Love this idea!! Bringing happiness to people as we travel around sounds very uplifting. I too look forward to more of your posts. love this I have one posted in my car that says before you stands a noble soul! Oh I love that :)! Haha, Ron, loved this comment :p! I love this idea! It reminds me of an art project I’m working on this summer, Art. Love. Rocks. A public art treasure hunt (http://art-love-rocks.tumblr.com/). 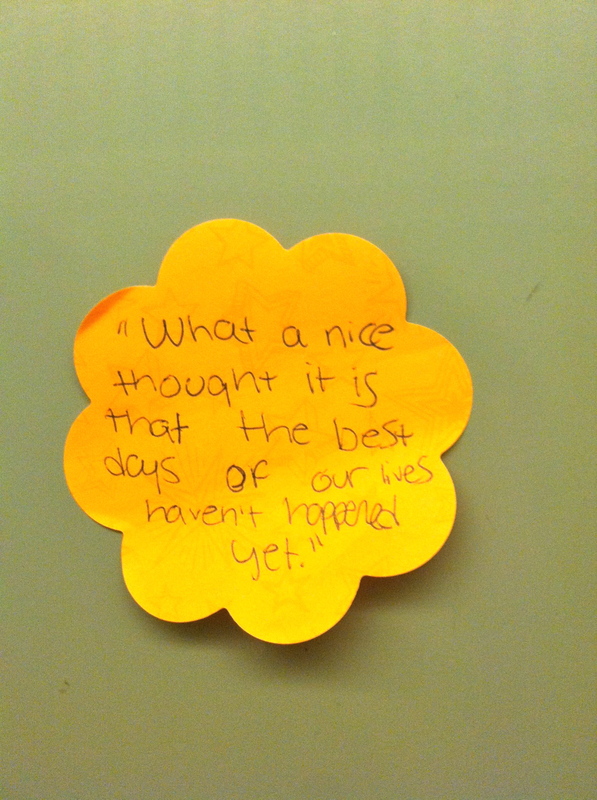 Are you still leaving post its? I once gave them flowers and sent them into the mall to give them to random strangers. Hi Christine, thank you for following my blog. I love your way of thinking. You are obviously a well-grounded and delightful human being. I will be looking at your blog on a regular basis and will be implementing the Post-It Note routine, Regards, Paul. Aww thanks so much Paul :)! Glad I found your blog! Thank you for adding some light to my life. 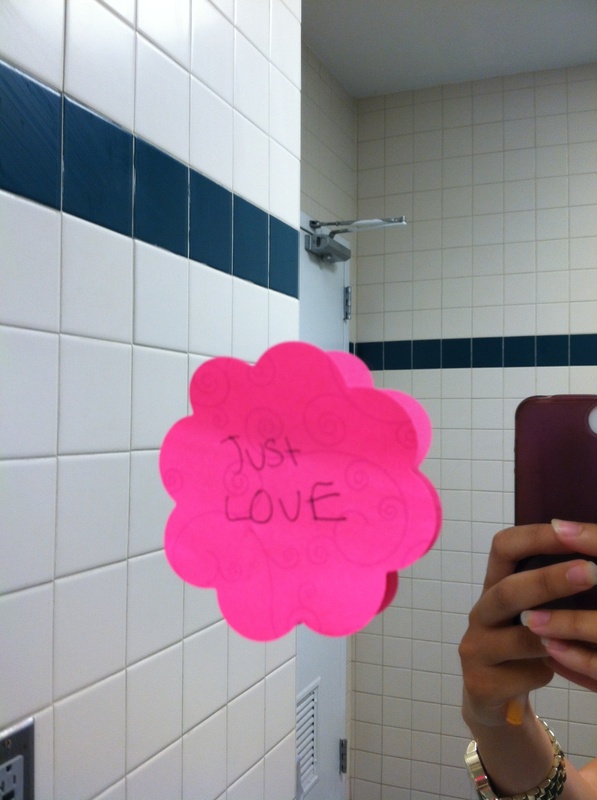 I would love to see a kind-hearted post-it note on a public bathroom door. It would feel very good, I’m sure. 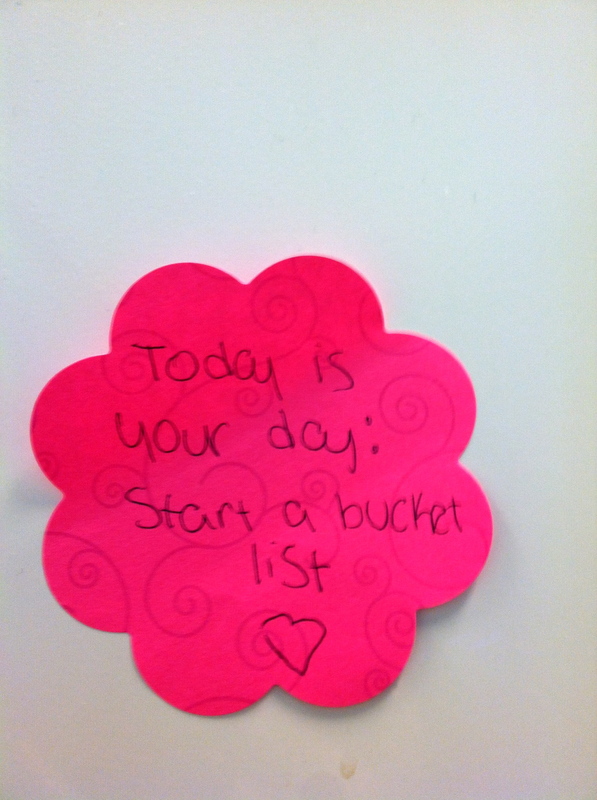 I was thinking of doing a blogpost about using post-it notes to remind me of everything. I am extremely forgetful. 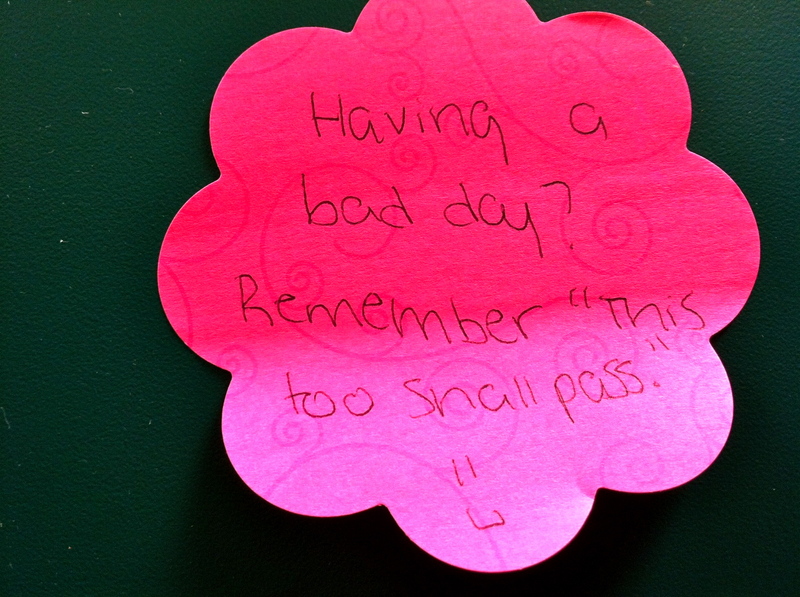 Thanks for following itsmindbloggleing. Yes, that would be a great blog post Nancy 🙂 I’m really forgetful myself, haha. Glad I found your blog! 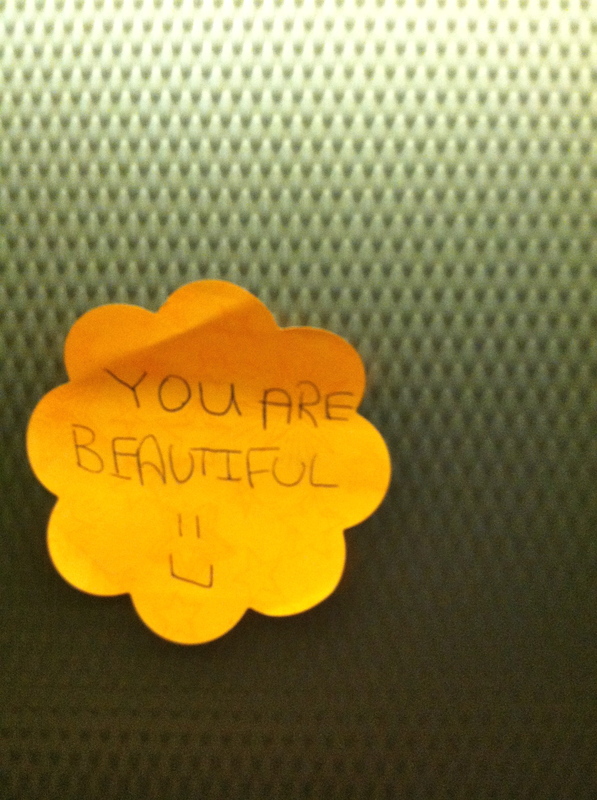 So nice of you to post such a nice piece of utility with sticky notes…and giving smiles to people around. Do you know what – Reading your post lead me to conclude an idea that was in my mind for few days. My idea was to use sticky notes on cars that are parked wrongly causing inconvenience. Often it is difficult to inform or contact owner of the car. So, pasting the note on the car with a message can be nice way to inform car owner.This can avoid parking fights. Can you do me a favour, write another post on my idea..give credit to my idea by adding a link to my blog. else i will plan to post it on mine. Each and every Facebook user has a unique experience on Facebook. and these who only make good friends with the folks they actually know. * To love without condition , To talk without intention , To give without reason and to care without expectation is the heart of a true friend. I wish for you……Comfort in difficult days , Smile when sadness intrudes, Rainbows to follow the clouds, laughter to feel your lips, Sunsets to warm your heart , Gentle hugs when spirits sags , Friendship to brighten your day , Beauty for your eyes to see , Confidence for when you doubt , Faith so that you can believe , Courage to know yourself , Patience to accept the truth , and definitely true love to complete your life. * Let me share a little personal true story with you. My mother died at 19 years of age, while giving me birth , one thing she said before she died was , please doctor give my son life take mine instead, because the doctor had told her the only way to save her life is to kill me , she replied by saying to the doctor, let my son live instead of me. 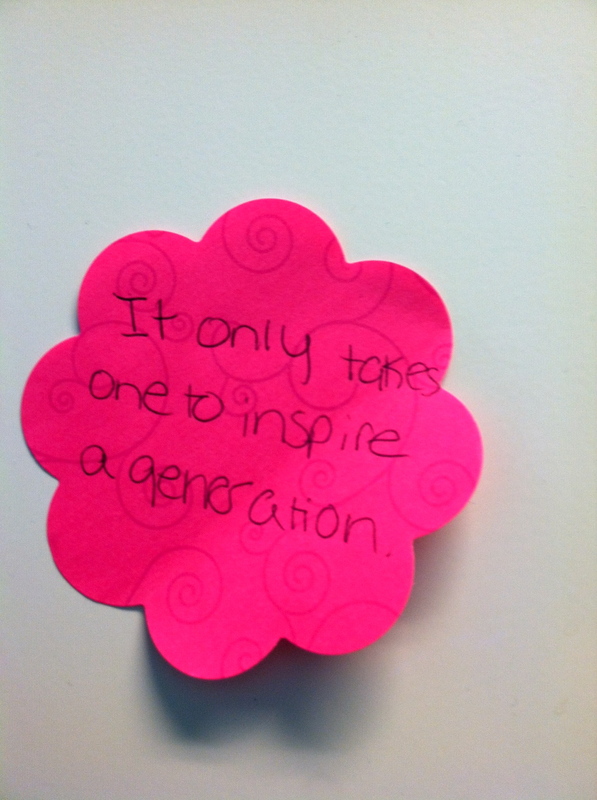 *Use that something to inspire someone today. Do or say something nice for someone today , without expecting anything in return, truly do it with all your heart. Call a friend or a family member today just to say thank you for being you , I appreciate every thing that you have done for me, if you have a friend or a partner stop somewhere get some flowers and give it to that person just because and watch their reaction , I promise that he or she reactions will be priceless. Please stop saying you can’t , please don’t blame the economy unless you give anything you are doing your all , please be strong, please empower yourself with greatness. *One last thing, don’t forget that you are the only one that hold the key to your happiness and success. Be in control of your life , but you must believe in yourself 100% no matter what and be a great manager for your life style! *Are being positive and respectful keep some people away from you? Do you love yourself first before loving anyone else? Do you appreciate and accept the way you look? Do you feel obligated to look a certain way? Do you believe in true love ? Do you have confidence in yourself ? Are you standing tall even if you 4 ft in height? Are you happy just for waking up today? Do you allow a man or a woman to disrespect or hit you? If so why? Are you tired of inconsistent men or women? You see , life it is not about what people think of you, life is about living it to the fullest, life is about loving your family, life is about being honest, life is about integrity, life is about respecting yourself, life is about being resilient , life is precious, life is what you make it, life is priceless. *Please get up and do something with your life , don’t depend on no one , take the first step, it’s okay to take baby step in order to achieve your goal , life is beautiful , please never give up on life most importantly never let no one break your spirit, kill them with kindness instead. * No one knows how life will turn out to be in the future, but one thing for sure you can do are: Live life to the fullest everyday, do things you love to do and stay consistent, be open minded, try to meet great people. Wake up everyday get on your knees and pray even if you don’t go to church. Don’t let no one break your spirit, because you are in control of your life. 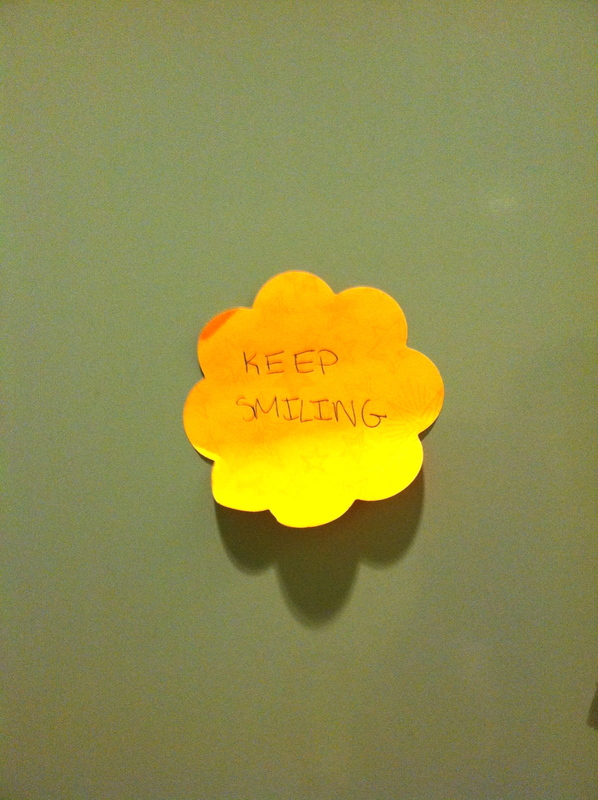 Empower yourself to do great things, entice yourself with positive energy , most importantly, please smile . *Keep believing in yourself no matter what , be happy and grateful just for waking up , love and appreciate yourself , You don’t need any one to tell you that You are handsome or beautiful , just believe in yourself and know that you are hansome or beautiful . I HAVE LEARNED THAT SUCCESS IS TO BE MEASURED NOT SO MUCH BY THE POSITION THAT ONE HAS REACHED IN LIFE AS BY THE OBSTACLES WHICH HE OR SHE HAS OVERCOME WHILE TRYING TO SUCCEED. “ALSO REMEMBER” (GIVING UP SHOULD NEVER BE AN OPTION IN YOUR LIFE). HAVE FAITH YOU SHALL RECEIVED.